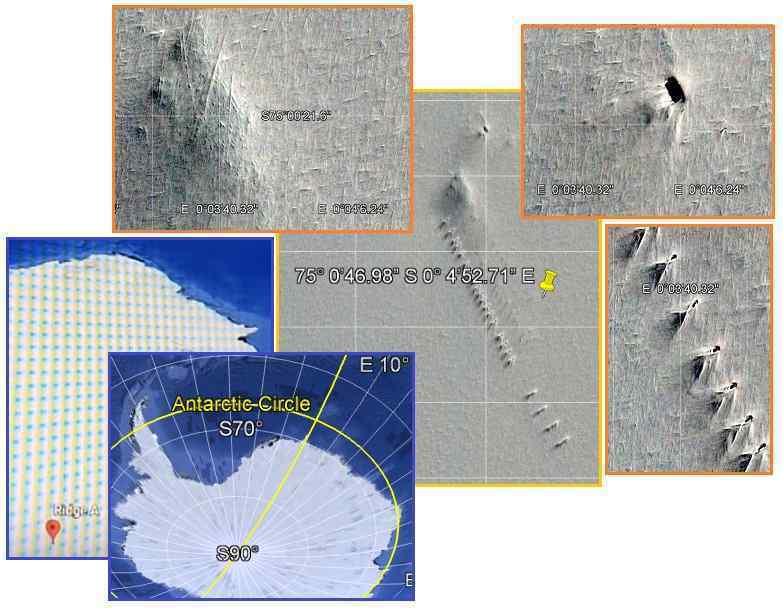 The slowly melting Antarctica ice continues to reveal the Annunaki past. We have commented on a launching pad, a desalination device, the remnants of cities, and space ship ports used by aliens other than the Annunaki. This newly discovered site, which appears to be a rack with a nearby entry to an underground port, is another launching site, which of course has a control booth nearby. Since it is not similar to mankind’s launching mechanisms, it is not recognized for what it is. This may be a new site for Internet aficionados but known to the establishment which has clearly visited to inspect. 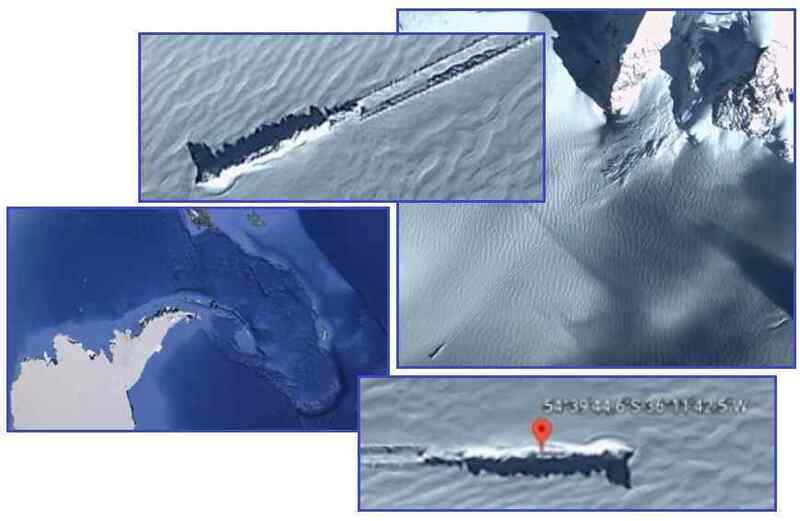 What is interpreted to be a crashed ship on the Scotia platelet near the tip of S America is not a crash at all but a routine port. The track marks are in fact rail lines used to tow a ship’s cargo to a nearby storage vault. Other than some rusting pieces of metal, nothing will be discovered by man, as the Annunaki took any technology they used with them when they evacuated Earth during their quarantine, not wanting to enable primitive man whom they knew would be gaining technology soon. Can Zeta give an insight about what exactly is happening? It was a bombing at Mezzeh military airport in Damascus on Sept 1, The airport is believed to house Syrian Air Force intelligence. Initially seems that the bombing was attributed to Israel but it was not the case. But “Q” also mention the incident, and that was followed by an strange explanation warning tweet from Trump. We know that Deep State sent loads of cash for Iran deal basically facilitate them to get Nuclear weapons via Syria, and they are still members with power of the Cabal that back up this deal like John Kerry. The only explanation that I have it was a nuclear head to be launched via airplane? And we just avoid a catastrophe! US Army did the job? Trump tweet point to “Hundreds of thousands of people could be killed”! Russia was gearing up for an event in the region too watching for shipping and flights. An intensely worded new Ministry of Foreign Affairs report circulating in the Kremlin today states that as Foreign Minister Lavrov has affirmed that Russian-American military communication links are remaining open, and his counterpart US Secretary of State Mike Pompeo has said “the world is watching”. The Ministry of Defense has issued a global warning declaring that the massively assembled Russian naval and air forces in the Mediterranean Sea off the coast of Syria are in full combat readiness and advise: “In the interests of ensuring the safety of shipping and air traffic.” Was this a Nuke? Cabal intention it was to start the WW3? 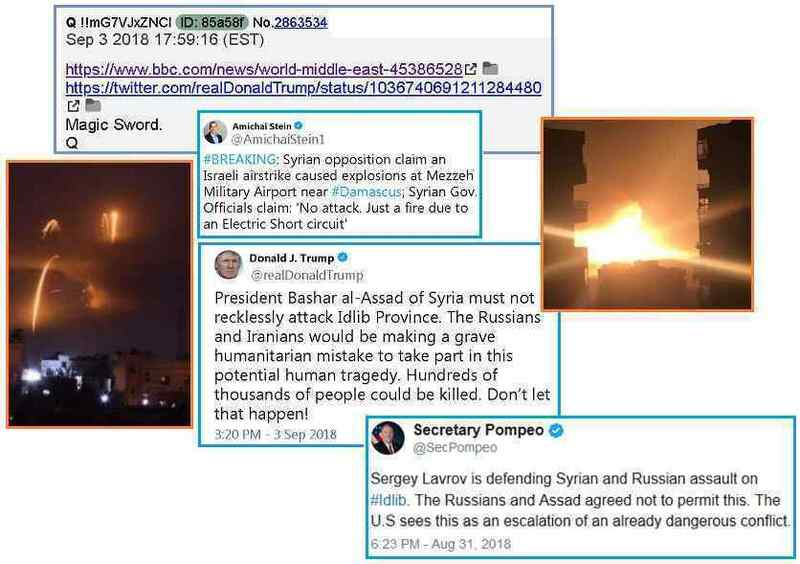 [and from another] http://www.zetatalk.com/newsletr/issue607.htm [and from another] https://twitter.com/AmichaiStein1/status/1036060071430705152 Syrian opposition claim an Israeli airstrike caused explosions at Mezzeh Military Airport near Damascus; Syrian Gov. Officials claim: 'No attack. Just a fire due to an Electric Short circuit'. [and from another] https://www.bbc.com/news/world-middle-east-45386528 Syria blasts at Mezzeh military airport 'not Israeli strikes September 2, 2018 Syria has denied reports that a series of blasts at a military airport near Damascus on Sunday were from Israeli air strikes. The loud blasts, reported at the Mezzeh airport, were caused by an explosion at a munitions dump. The incident was the result of an electrical fault. Israel has launched air strikes against Syria in the past and was accused of targeting Mezzeh airport last year. The airport is believed to house Syrian Air Force intelligence. [and from another] https://twitter.com/realDonaldTrump/status/1036740691211284480 [and from another] https://www.sott.net/article/395064-John-Kerry-accuses-Trump-of-making-things-up-on-Iran John Kerry accuses Trump of 'making things up' on Iran September 3, 2018 The former US Secretary of State said that President Trump's decision in May to leave the 2015 Iran nuclear deal "weakens our security, breaks America's word [and] isolates us from our European allies." [and from another] http://tass.com/politics/1019437 Russia ready to boost military contacts with US — Lavrov August 31, 2018 The Russian Defense Ministry and the US Department of Defense have been maintaining contacts on Syria in a real-time mode. "There is an agreement on a mechanism to prevent unintentional accidents and it works," Lavrov added. Lavrov says US attempt at ‘regime change’ in Syria failed. [and from another] https://www.aljazeera.com/news/2018/09/pompeo-world-watching-situation-idlib-180901075355966.html Pompeo says 'world is watching' the situation in Idlib September 1, 2019 US Secretary of State Mike Pompeo has accused his Russian counterpart Sergey Lavrov of "defending the assault" by Syrian government forces on the last rebel stronghold in Idlib province. Forces loyal to the Syrian President Bashar al-Assad have been massing around Idlib, which borders Turkey, for days and seem ready to launch what could be the last major battle of the civil war that has torn the country apart since 2011. [and from another] https://www.express.co.uk/news/world/1011613/Russia-news-war-games-Mediterranean-military-drills-Syria Russia has declared part of the Mediterranean will be ‘dangerous’ while they hold a massive naval exercise ahead of the final assault on Syria’s rebels. [and from another] https://www.rt.com/news/437524-idlib-terrorists-pompeo-syria/ 3 September, 2018 'US wants terrorists to stay in Idlib; just imagine what Pompeo would say if they were in Oregon' US Secretary of State Mike Pompeo accused Moscow and Damascus of escalating the Syrian conflict by seeking to clear terrorist groups from Idlib province. He said the civilian population will end up as victims of any offensive. Now, we've got the Syrian government saying they are going to retake all of Syria – which is their right under international law and the UN – but what is going to happen with the terrorists? This attempt to spark war between the US and Russia in Syria should be seen in the context of John McCain’s “death” and funeral, in order to encourage the remnants of the Cabal still hoping to spark a war between the US and Russia. McCain was a known supporter of the anti-Assad rebels, as he was fervently anti-Russian. He was charged by the US Junta in a military tribunal for helping to supply the anti-Assad rebels with poison gas, which was to be used to frame Assad for a chemical weapons attack. At that time, these rebel depots were openly bombed by the US. What happened at the International Space Station? Rogozin said that all versions are considered and most likely this is not a meteorite. Looks like drilled. The photo below is a small hole, large - (looks like) this is part of the construction. Maxim Suraev, a former astronaut and now a deputy of the State Duma, commented that it could have been a mentally unhealthy astronaut. A warning to remain silent? James Forrestal 2.0? Later, NASA mystically deleted photos of the hole. [and from another] https://www.cnet.com/news/iss-hole-may-have-been-made-by-a-human/ 4 September, 2018. ISS leak may be a drill hole. 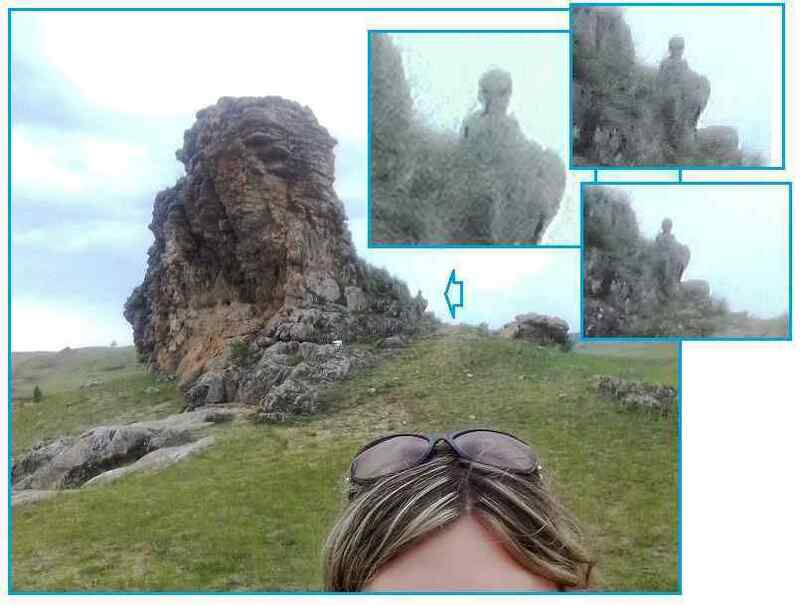 It was done by a human hand. There are traces of a drill sliding along the surface. TASS later reported Monday that the hole could have been caused accidentally by a worker on Earth. The news agency cited a source in the space rocket industry who said that a worker may have patched the hole with glue and that the patch later failed in orbit. To add to the intrigue, space news site NASASpaceFlight.com noticed images of the hole in a NASA Space to Ground video update, which was taken down and later re-released without the photos. [and from another] https://www.telegraph.co.uk/science/2018/09/04/hole-international-space-station-drilled-deliberately-says-russian/ 4 September, 2018 Hole in International Space Station was drilled deliberately, says Russian space agency. 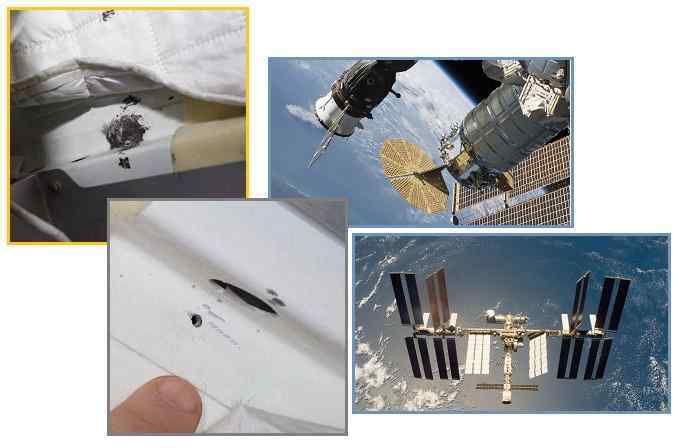 Space debris or a micro-meteorite was initially blamed for the damage, but new pictures show the hole had been deliberately drilled and the Russian Space Agency Roscosmos and module manufacturer RSC Energia have launched an investigation to find the culprit. It could have been carried out by a homesick astronaut. A mentally unstable crew member could not be ruled out. The ISS had a drill on board capable of making the hole. [and from another] https://www.npr.org/2018/09/05/644820679/who-caused-the-mysterious-leak-at-the-international-space-station Who Caused The Mysterious Leak At The International Space Station? September 5, 2018 The crew identified the source of the leak as a 2-millimeter hole in the upper section of a Soyuz MS-09 spacecraft, which is docked in the Russian section of the space station. It seems to be done by a faltering hand. They have dismissed a theory that the hole was caused by a meteorite. Another possibility: "Most probably all had happened at the manufacturer's plant. The hole appears to be hand-drilled through the material that's about half an inch thick.” [and from another] https://en.wikipedia.org/wiki/Soyuz_(rocket_family) Since the retirement of the Space Shuttle fleet in 2011, the U.S. space program is without any means to take astronauts into orbit, and NASA is dependent on the Soyuz to send crew into space for the immediate future. Soyuz-FG still carries astronaut crews to the ISS as of 2018. [and from another] https://en.wikipedia.org/wiki/Human_spaceflight Currently, all expeditions to the International Space Station use Soyuz vehicles, which remain attached to the station to allow quick return if needed. The United States is developing commercial crew transportation to facilitate domestic access to ISS. Commercial resupply of ISS began two years after the retirement of the Shuttle, and commercial crew launches could begin by 2018. [and from another] https://en.wikipedia.org/wiki/Space_Shuttle The Space Shuttle was retired from service upon the conclusion of Atlantis's final flight on July 21, 2011. The U.S. has since relied primarily on the Russian Soyuz spacecraft to transport supplies and astronauts to the International Space Station. Until another U.S. manned spacecraft is ready, crews will travel to and from the International Space Station (ISS) exclusively aboard the Russian Soyuz spacecraft. [and from another] https://www.space.com/41110-russia-launches-superfast-cargo-ship-to-space-station.html Russia Just Launched the Fastest Cargo Mission Ever to the Space Station July 9, 2018 Packed with nearly 3 tons (2.7 metric tons) of food, fuel and other supplies, the uncrewed Progress cargo ship lifted off from the Baikonur Cosmodrome in Kazakhstan on a Russian Soyuz rocket. After the spacecraft docks, the six crewmembers of Expedition 56 will spend the next few months unloading the cargo, which includes 1,170 lbs. (530 kilograms) of propellant, 115 lbs. (52 kg) of oxygen gas, 930 lbs. (420 kg) of water, and 3,450 lbs. (1,565 kg) of other "dry" cargo like food and other equipment. The spacecraft will remain docked at the ISS until January 2019. [and from another] https://blogs.nasa.gov/spacestation/tag/soyuz/ Three new Expedition 56 crew members were welcomed aboard the International Space Station today. Hatches between the space station and Soyuz opened at 11:17 a.m. EDT, marking the arrival of Expedition 56 Flight Engineers Serena Auñón-Chancellor of NASA, Alexander Gerst of ESA (European Space Agency), and cosmonaut Sergey Prokopyev of Roscosmos. The Soyuz MS-09 carrying the trio launched from the Baikonur Cosmodrome in Kazakhstan at 7:12 a.m. Wednesday, June 6. They joined Expedition 56 Commander Drew Feustel and Flight Engineers Ricky Arnold of NASA and Oleg Artemyev of Roscosmos aboard the orbiting laboratory. What happened? [and from another] The same object crossing back today!? [and from another] https://www.kvia.com/news/top-stories/closure-of-national-solar-observatory-remains-shrouded-in-mystery/793035021 10 September, 2018. Closure of National Solar Observatory remains shrouded in secrecy. ABC-7 has confirmed the post office in Sunspot will not be re-opened until further notice, and cannot be re-opened until approved by local law enforcement officials. ABC-7 Monday spoke with Shari Lifson, who is with Aura, the company that co-manages the Observatory with NMSU. Lifson told ABC 7 there is no time-table for the Observatory to be re-opened. ABC-7 also reached out the FBI, but did not hear back from the federal agency in time for deadline. The FBI did speak with local law enforcement about the length of the observatory closure. The FBI did not tell Sheriff House the reason for the closure. [and from another] https://www.zerohedge.com/news/2018-09-11/national-solar-observatory-mysteriously-closed-geomagnetic-storm-looms 11 September, 2018. National Solar Observatory Mysteriously Closed As Geomagnetic Storm Looms The FBI is refusing to tell us what’s going on. We’ve got people up there (at Sunspot) that requested us to standby while they evacuate it. Nobody would really elaborate on any of the circumstances as to why. [and from another] https://www.youtube.com/watch?v=xS5k0eIkMQA&feature=share ~Sky Phenomenon~ | "Object" in front of Sun [and from another] Really strange footage of moon eclipsing sun forward and backwards in time-lapse video. Very weird stuff for sure. What's the deal with the observatory being shutdown in New Mexico for no apparent reason?? [and from another] Isn't it ironic that the National Solar Observatory in New Mexico was IMMEDIATELY shut down,on that same day? Maybe it wasn’t the moon. [and from another] Is this why the FBI took control of Sun Spot Solar Observatory in New Mexico a few days ago? [and from another] https://www.godlikeproductions.com/forum1/message3902305/pg1 [and from another] National Solar Observatory, USPS office in Sunspot, NM evacuated for 'safety reasons' September 7, 2018 https://www.kvia.com/news/new-mexico/national-solar-observatory-usps-office-in-sunspot-nm-evacuated-for-safety-reasons-/792020771 The National Solar Observatory in Sunspot, New Mexico, and a nearby United States Postal Service office, were evacuated for security reasons Thursday. Friday, both properties remained closed to the public, with yellow caution tape around the property. A post office in the area has also been shut down. [and from another] https://www.nasa.gov/feature/goddard/2018/nasa-s-sdo-spots-2-lunar-transits-in-space On Sept. 9, 2018, NASA’s Solar Dynamics Observatory, SDO, saw two lunar transits as the Moon passed in front of the Sun. A transit happens when a celestial body passes between a larger body and an observer. This first lunar transit lasted one hour, from 4:30 pm to 5:30 p.m. EDT and obscured 92 percent of the Sun at the peak of its journey. The second transit happened several hours later at 9:52 p.m. and lasted a total of 49 minutes, ending at 10:41 p.m. EDT. This transit only obscured 34 percent of the Sun at its peak. [and from another] https://www.dailystar.co.uk/news/weird-news/729132/Alien-news-space-observatory-lockdown-FBI-investigate-New-Mexico-video 12 September, 2018. 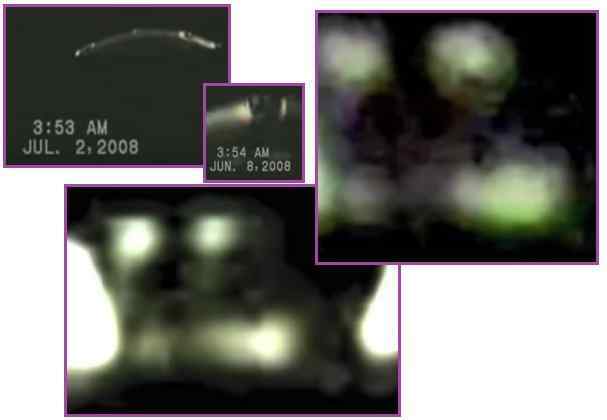 Space observatory LOCKDOWN sparks claims alien life has been spotted as FBI investigate. Astronomers in the observatory spotted something the government did not like. While taking images of the sun, they may have come across a secret military project or even extraterrestrial life. The FBI would have been brought in to remove any evidence of this. What recently caused the numerous gas explosions North of Boston [and from another] https://www.dailymail.co.uk/news/article-6168675/Boston-gas-company-start-improvement-works-pipes-FOUR-days-explosions.html Columbia Gas was due to start replacing its network of old pipes. It's unclear as of yet whether the over-pressurized gas main, which has been informally blamed for the explosions, was one of the sets of pipes it needed to replace. 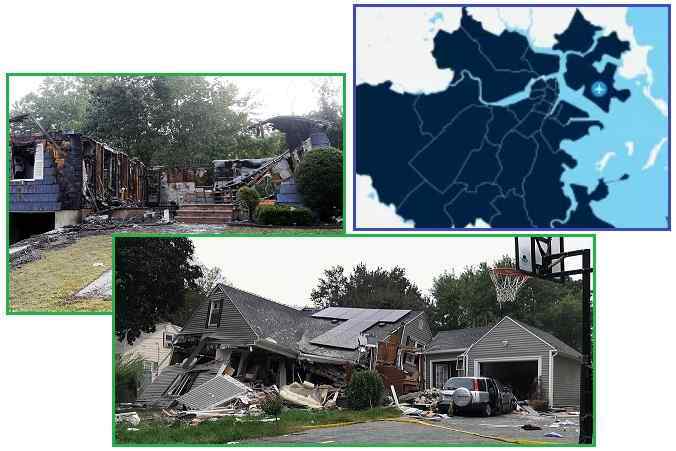 Gas explosions ripped across Lawrence, Andover, and North Andover, setting dozens of homes ablaze, injuring more than 20, and killing one. According to the state fire marshal, which is still investigating the cause of the accident, it is likely that an over pressurized gas main is what caused it. As the bow stress on the N American continent increases, the outer edge of the bow is stretched apart. Clearly Boston, which lies at the juncture of several rivers, would be subject to this stretch. River bottoms represent weak points in the crust, thus thin to begin with, they sink and fill with water. Were the Boston gasline breaches due to old pipes and high pressure? Old pipes can be fragile and if there are gas line leaks, the gas company could have stepped up the pressure to continue serving customers. But the true cause of this holocaust was the N American bow stretch. The flap over the supposed UFO sighting - a mothership and a cloud of individual ships near the Sun - based on a single posting on a FaceBook page, is astonishing. Were it not for the closing of the solar observatories globally, in several countries, this would not have gotten a mention. 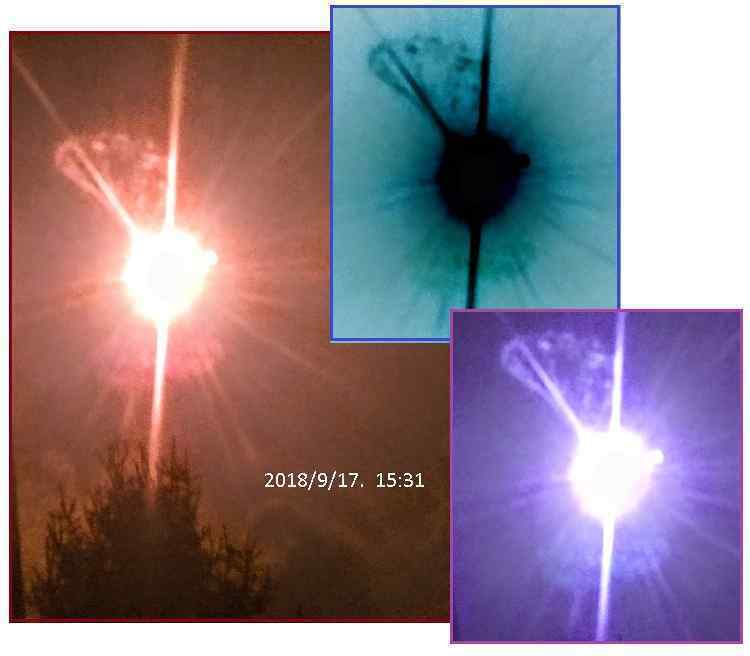 The photos clearly show the debris in the tail of Nibiru with more than one Monster Persona of Moon Swirls – both a common occurrence in photos of the Nibiru complex for over a decade. Enhancing the photos to a green overcast to bring out the detail only makes them seem more eerie, befitting an alien invasion story. 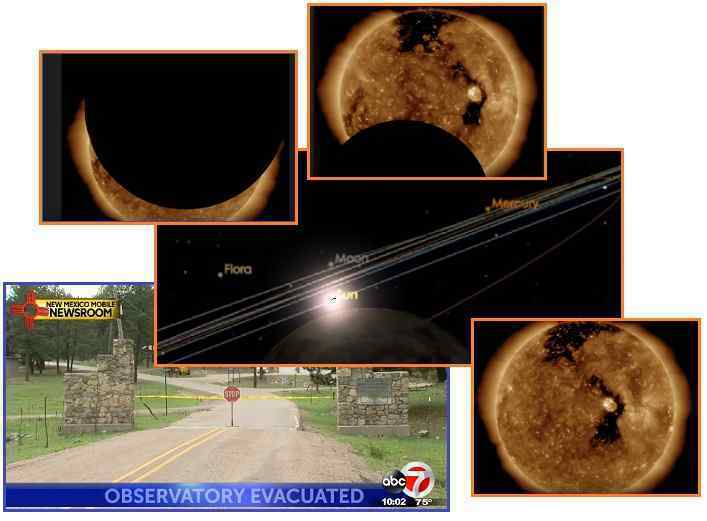 The solar observatory in New Mexico was suddenly shuttered because those in the US government concerned that the cover-up over Nibiru might unravel felt there might be a rebel willing to leak proof of Nibiru to the public. This paranoia rapidly spread to other countries. The cover-up over Nibiru has the USGS dominating the earthquake releases, thus a central control effectively lying about the reported magnitude and number of quakes. 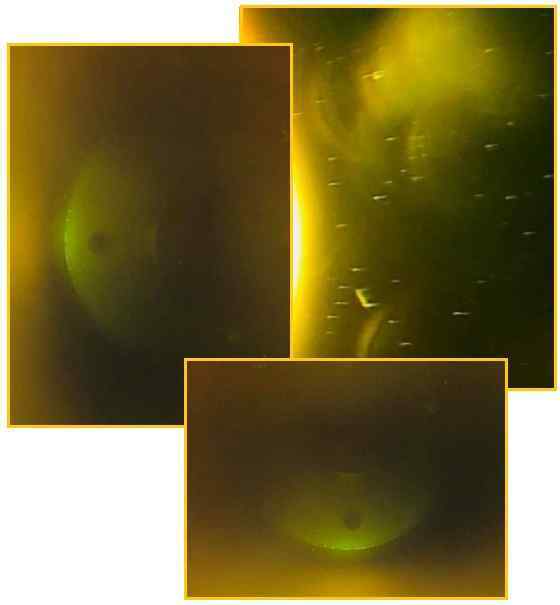 NASA can delay and doctor the SOHO images, and any magnetic charts are withheld or doctored likewise. Now looking at the Sun through high powered telescopes is being withheld. Human nature being what it is, any tool given to a bureaucrat that would allow them to protect their jobs, cover the trail of any illicit gifts they may have accepted, and prevent their history or track record from being examined would be used. Would a teenager wanting to order items using their parents' credit card, and using the family car to party hop, want to prevent their parents from discovering this mischief? This type of rot is what infects any government or organization from day one, so that only some type of revolution can bring change. Where elections bring great change within an administration, because the opposing parties are basically at war with each other, there is some cleansing that can result. At least new faces are put in charge, determined to clean out the prior administration's lackeys. Purges are another route, or coups and counter-coups where the establishment is removed or those in opposition are eliminated. Tossing out the rule book or rewriting it, as was done in 1776 to establish the US government also occur on occasion. But given that this is human nature, nothing really changes. Why do the String of Pearls so often show the pearls lining up side by side, like each pearl is holding hands with another? The String of Pearls has been described as a series of dominant Moons, each with their own swirl behind them, that line up side by side. When these tubes are turned so one end of the tube is facing Earth, each Moon Swirl looks like a well-lit orb, a pearl. What forces cause the pearls to line up with each other? Similar forces cause tornados to swarm, skipping across the land. They don’t all join to form a single large tornado as each is dealing with the rising and falling air masses of different temperatures and air pressure. Thus they form individual tornados. Moon Swirls have within them a retrograde swirl. Such a swirling motion affects all the minor moons and debris within the tube, but also pulls at dust and debris in a neighboring Moon Swirl. Thus the swirls are pulled next to each other, as the dominant Moon Swirl starts the process, then another is pulled into a void next to the dominant tube, and likewise down along the String of Pearls. Why are these pearls frequently matched with a second Moon Swirl? The voids from the retrograde spin affect all sides of a Moon Swirl, so when lining up as a pair they form stable quadrants down the line, linked together. There is an update to an earlier post about the solar observatory that was shut down is now open again. The excuse for shutting it down s rightly gotten everyone suspicious as the Zetas have told us the real reason. My question is, why reopen it? Did our discussion about it make the cover-up nervous? Did they somehow alter the observatory so it will not show anything by the Sun? [and from another] https://www.zerohedge.com/news/2018-09-18/evacuated-solar-observatory-set-re-open-officials-offer-unbelievable-explanation No word on why the FBI was involved, or urgently needed to fly in on a loud, suspect-spooking helicopter instead of simply driving to the facility, or why they couldn't just arrest the guy and keep the place open. Also no explanation for the work crew climbing all over the towers, or why they shut down the post office. Given the frustratingly vague response that in no way answers major questions about the incident, it's safe to say we can add this one to the X-Files. The 30 second delay on most live TV broadcasts is in place to prevent the “F…” word from being uttered without a “bleep”. Likewise live views of the Sun, from the several solar observatories worldwide that were suddenly closed during the September 9 revelations of Nibiru Moon Swirls, will now reopen with a delay. Much of the monitoring will be automatic, just as preventing any direct view of Nibiru on the SOHO images is done by automatic editing of Nibiru’s presumed location. Why was the staff removed during these adjustments? To limit witnesses to the operation. Few know. The Borovoe lake region in Kazakhstan is intersected by perfectly straight lines stretching for tens of kilometers that delineate the forest into equal rectangles. What was this done for? [and from another] https://earth.google.com/web/@53.08423179,70.24023358,349.78308066a,9968.82047098d,35y,308.75171913h,0t,0r [and from another] https://sibved.livejournal.com/3970.html [and from another] http://www.zetatalk.com/newsletr/issue359.htm A ceramic map of the Ural Mountains. 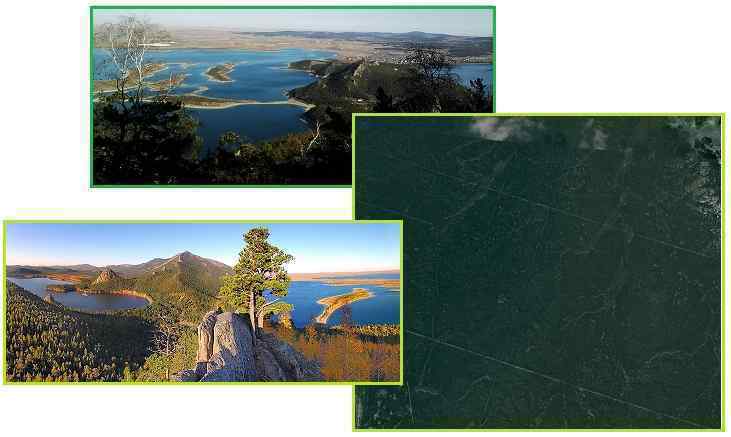 As we have confirmed in prior ZetaTalk, the ancient map found in the Ural Mountains was a guide for the intelligent raptors that were the dominant species on Earth millions of years ago. As we pointed out, this map showed irrigation lines. Now such an ancient irrigation system has shown up on Google Earth images in nearby Kazakhstan. This region has of course experienced upheaval, as the Eurasian Plate is being pulled apart and rumpling of the land is apparent. Where now a forest, this region was suitable for crops in the past, and the irrigation lines are visible only because the present day Kazakhstan has not plowed over them. Could the Zetas tell what triggered that unexpected tsunami? The authorities canceled the tsunami threat because of a lack of data in that area. 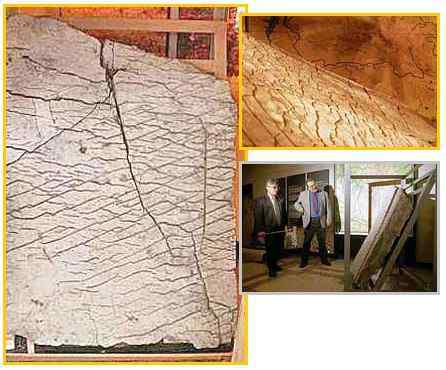 Scientists also point out that the wave is too high for this type of earthquake (slip-strike). Yea, and in general the tsunami for this type of earthquake is rare. Example in 2012 when there was an earthquake (slip-strike) in Sumatra and there was no tsunami. [and from another] https://www.usgs.gov/faqs/what-it-about-earthquake-causes-a-tsunami?qt-news_science_products=0#qt-news_science_products The earthquake must be a shallow marine event that displaces the seafloor. Thrust earthquakes (as opposed to strike slip) are far more likely to generate tsunamis. 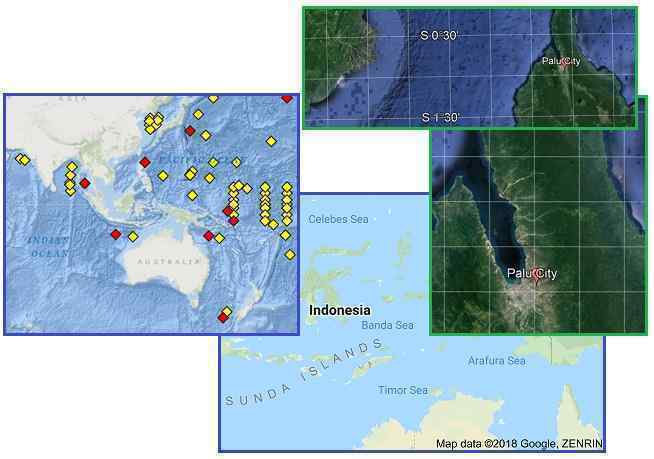 [and from another] https://www.thestar.com.my/news/world/2018/09/29/indonesia-tsunami-sensors-missed-huge-waves--official/ 29 September, 2018. Indonesia tsunami sensors missed huge waves. The closest tide gauge, which measures changes in sea level, only recorded an "insignificant", 6cm wave and did not account for the giant waves near Palu. 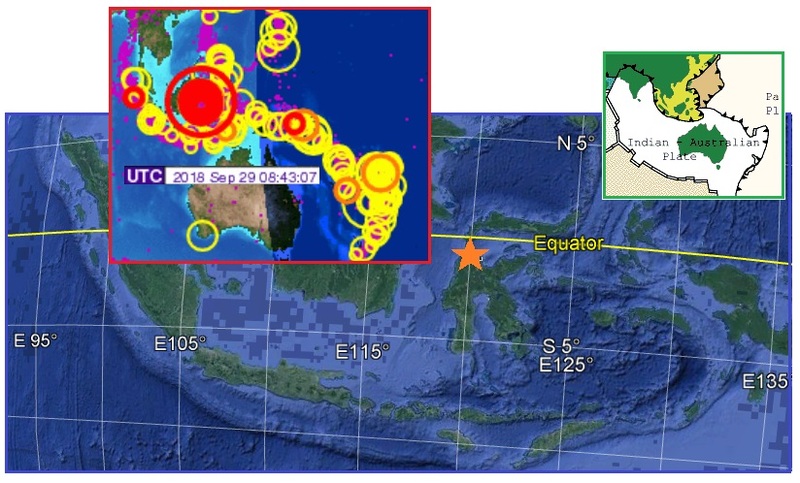 [and from another] https://www.straitstimes.com/asia/se-asia/indonesia-tsunami-sensors-missed-huge-waves-official Friday's quake was recorded as a "strike-slip" event where neighbouring tectonic plates move horizontally against each other, rather than vertically, which is what usually generates a tsunami. "There is some speculation that there was a landslide under the sea which displaced a lot of water and caused the tsunami," he said, adding the narrow bay may have concentrated the force of the waves as they moved toward the shore. [and from another] https://www.nationalgeographic.com/environment/2018/09/indonesia-tsunami-sulawesi-explained-science-geology/ 28 September, 2018. Indonesia's Surprise Tsunami, Explained. The 7.5-magnitude earthquake appears to be the result of what's known as a strike-slip fault, which takes place as two blocks of crust grind against one another, largely in a horizontal direction. Tsunamis more commonly follow vertical movement in the crust, which disrupts the overlying water and can generate massive waves crashing onshore.